In the last decade, the U.S. has embraced the Day of the Dead with enthusiasm. Brightly colored calaveras grin from T-shirts and coffee mugs. Day of the Dead festivals announce events ranging from 10k runs to concerts to art fairs. Children, however, do not always see that behind the beautiful icons and festive atmosphere the Day of the Dead has great significance for many people. 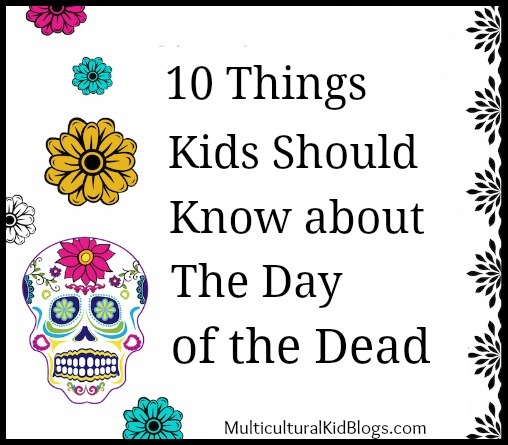 You can help children understand the tradition with these basic Day of the Dead facts. Talking to kids about the Day of the Dead, I don’t relate the holiday to Halloween, other than to mention that it is celebrated at about the same time of year but is very different. I focus on the reason for the celebration, the atmosphere, and the tradition of making altars. 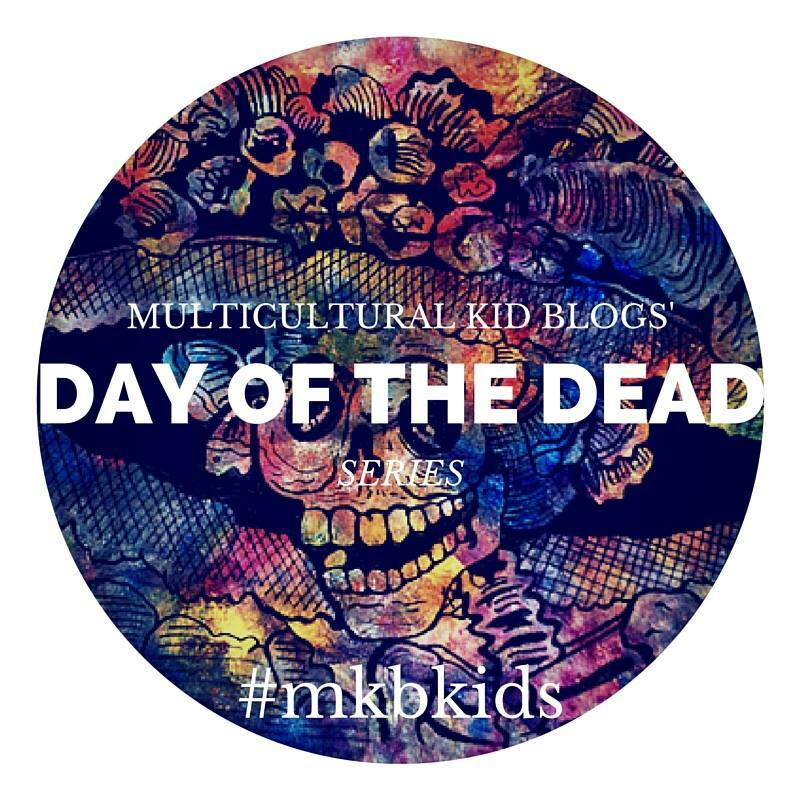 Download printable versions of these Day of the Dead facts in English or Spanish using the links at the end of this post. The printables are available in color or black and white for kids to color themselves. 1. The Day of the Dead is not Halloween. The Day of the Dead and Halloween are celebrated at the same time of year, but they are very different. El Día de los muertos no es igual a Halloween. El Día de los muertos y Halloween se celebran durante los mismos días del año, pero son muy distintos. 2. The Day of the Dead is celebrated on November 1 and 2. The celebration starts November 1st. The Day of the Dead is November 2nd. El Día de los muertos se celebra el 1 y 2 de noviembre. La celebración empieza el 1 de noviembre. El Día de los muertos es el 2 de noviembre. 3. The Day of the Dead is a time to remember family and friends who have died. El Día de los muertos es un momento para recordar familiares y amigos que han muerto. 4. The Day of the Dead is not a sad tradition. It is a festive time to remember and honor the dead. El Día de los muertos no es una tradición triste. Es una ocasión alegre para recordar y honrar a los muertos. 5. The Day of the Dead is a Mexican celebration. The Day of the Dead originated in Mexico. It is also celebrated in parts of Latin America and the United States. El Día de los muertos es una celebración mexicana. La tradición tiene su origen en México. También se celebra en partes de Latinoamérica y Estados Unidos. 6. As a part of the Day of the Dead celebration, families build altars in their homes for loved ones who have died. Como parte del festejo del Día de los muertos, las familias hacen altares en la casa para los seres queridos que han muerto. 7. Day of the Dead altars have many traditional elements. A few the essential elements are candles, marigolds, a photo, sugar skulls, water, food and cut paper decorations called papel picado. Los altares del Día de los muertos tienen muchos elementos tradicionales. Algunos de los elementos esenciales son velas, cempasúchiles, una foto, calaveras, agua, comida y decoraciones de papel cortado que se llama papel picado. 8. Calaveras are decorated skulls. These brightly colored skulls are made of sugar or ceramic. They are used to decorate Day of the Dead altars. Las calaveras son cráneos decorados. Estas calaveras pintadas con colores brillantes son de azúcar o de cerámica. 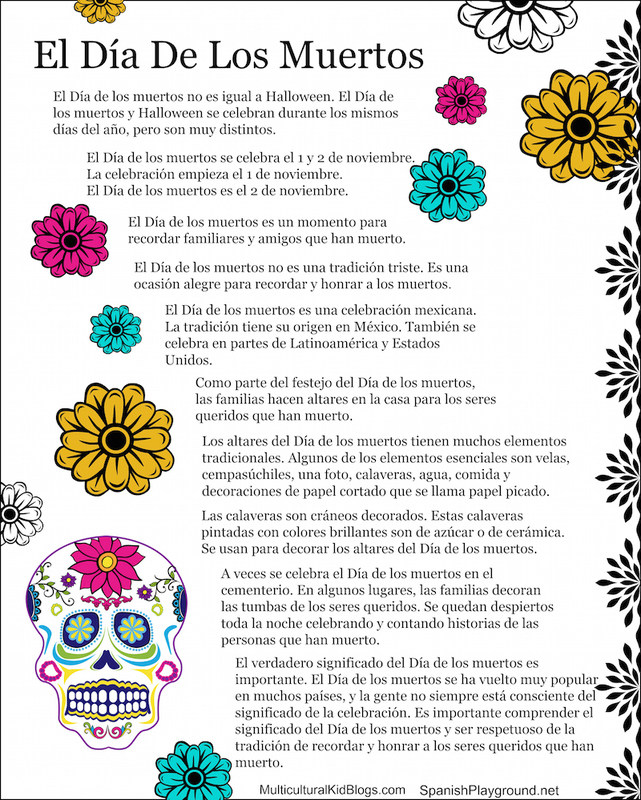 Se usan para decorar los altares del Día de los muertos. 9. The Day of the Dead is sometimes celebrated in graveyards. In some areas, families decorate the graves of their loved ones. They stay up all night celebrating and telling stories about the people who have died. A veces se celebra el Día de los muertos en el cementerio. En algunos lugares, las familias decoran las tumbas de los seres queridos. Se quedan despiertos toda la noche celebrando y contando historias de las personas que han muerto. 10. The true meaning of the Day of the Dead is important. The Day of the Dead has become very popular in many countries, and people are not always aware of the meaning of the holiday. People sometimes combine the Day of the Dead with Halloween. It is important to understand the significance of the Day of the Dead and be respectful of the tradition of honoring and remembering love ones who have died. El verdadero significado del Día de los muertos es importante. El Día de los muertos se ha vuelto muy popular en muchos países, y la gente no siempre está consciente del significado de la celebración. Es importante comprender el significado del Día de los muertos y ser respetuoso de la tradición de recordar y honrar a los seres queridos que han muerto. This post is part of our first annual Day of the Dead series. Visit our main page for the full schedule of articles and to link up your own! Este articulo es MUY educativo. Gracias! Like a more colorful version of what we do on memorial day… Cleaning and decorating graves of loved ones, sharing stories about them and showing respect.